According to a study by international healthcare group Bupa, 42% of the 2000 people surveyed said that their smile is the first thing they would change about themselves and a little over a third of the surveyed group said they’re embarrassed by their smile. What’s more? Orthodontics Limited reports that teeth are second only to weight when it comes to things people feel insecure about. 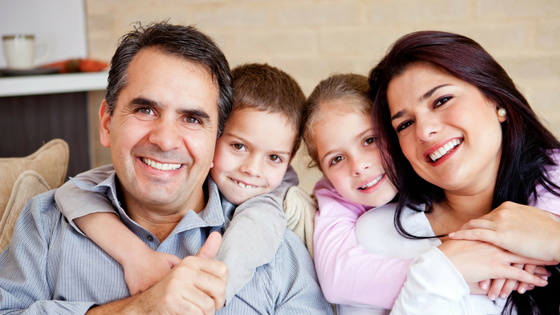 Fortunately, at Eggert Family Dentistry, there are a plethora of ways you can choose to improve your smile. Let’s take a closer look at 5 popular smile-enhancing options that we offer at our clinic! Tooth Whitening: Over time, due to poor brushing habits and consumption of acidic and richly-hued foods and beverages, teeth become yellowed and dull. Tooth whitening is a safe and cost-effective procedure that brings back brilliance to your pearly whites. While historically triggering nerve sensitivity, today’s whitening agents contain fluoride and other desensitizing agents which reduce the risk of sensitivity. If properly maintained, the positive effects of tooth whitening can last for a number of years. It’s important to keep in mind that anything that can stain a white shirt can stain your smile. Ensuring thorough brushing after consumption of stain-inducing foods and beverages will extend the life of your tooth whitening procedure. Bonding: This is an effective way to fill in gaps in your teeth – particularly the unsightly gaps in the front of your mouth – as well as whitening yellowing or darkening teeth. The results from bonding are immediate and stunning. As with teeth whitening, however, it is important to practice good oral habits in order to avoid new staining and discoloration from foods and beverages. Porcelain Veneers: While the term may conjure up images of fragile dolls and china, porcelain veneers are actually incredibly strong and durable. These veneers are thin pieces of porcelain that are applied directly to your natural teeth for the purpose of changing their size, shape or color or to repair fractured teeth or improve the appearance of a crooked smile. This entire procedure can be accomplished in as little as two visits with Dr. Elizabeth or Dr. Jeff. Many people choose porcelain veneers simply to feel and look younger with a straighter, whiter smile! Crowns: Crowns thoroughly cover a tooth in order to give the tooth the protection it needs to function correctly or for the purpose of changing its size, shape or color. We are fortunate to be able to complete crowns in only one visit in our office with our CEREC crown procedure. Invisalign®: As we’ve highlighted in recent posts, Invisalign® is a fantastic alternative to braces for many teens and adults. 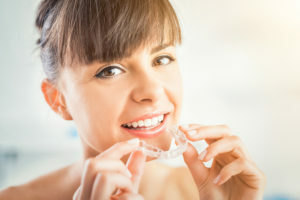 With the use of transparent, low-profile aligner trays, teeth can be straightened and improper bites corrected. This procedure is typically more comfortable, less visible and takes less time than teeth straightening and bite correction with traditional metal braces. If you long for a confident smile and are considering any of these great smile-enhancing options, please contact our office. We would love to consult with you and provide you with a treatment plan that is right for you!